In January 2012, The Museum of Vertebrate Zoology was awarded a three-year grant from the Council for Library and Information Resources to catalog and make more accessible its hidden archives of fieldnotes, correspondence, annotated maps, images, and artwork. This exciting new project will eventually provide access to evidence of the historical, ecological, legal, and sociological context for the vertebrate specimens that comprise the Museum's collections. Read more about the CLIR funding here. 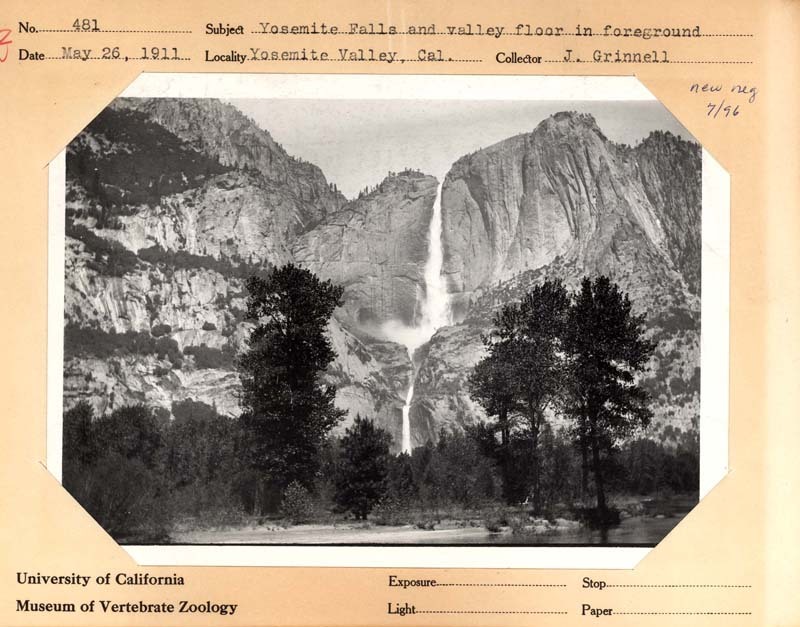 The MVZ formerly received funding from the National Science Foundation in 2003 to capture metadata for its collections of historic fieldnotes, photographs, and annotated maps, and to digitize material from pre-1950 collecting expeditions in California. The primary goal of this project was to increase access to this invaluable material for scientific researchers, conservation and management agencies, non-governmental organizations, historians, and other users, while also contributing significantly to the Museum’s own research, education, and curatorial programs. Notably, this effort continues to have direct relevance to the MVZ's Grinnell Resurvey Project, which aims to revisit over 200 sites in California to examine spatiotemporal changes in fauna in the context of natural or human-induced environmental trends. With the help of the CLIR grant, the Museum aims to build upon the achievements of the NSF project and to provide even more comprehensive access to its archival materials in the future. 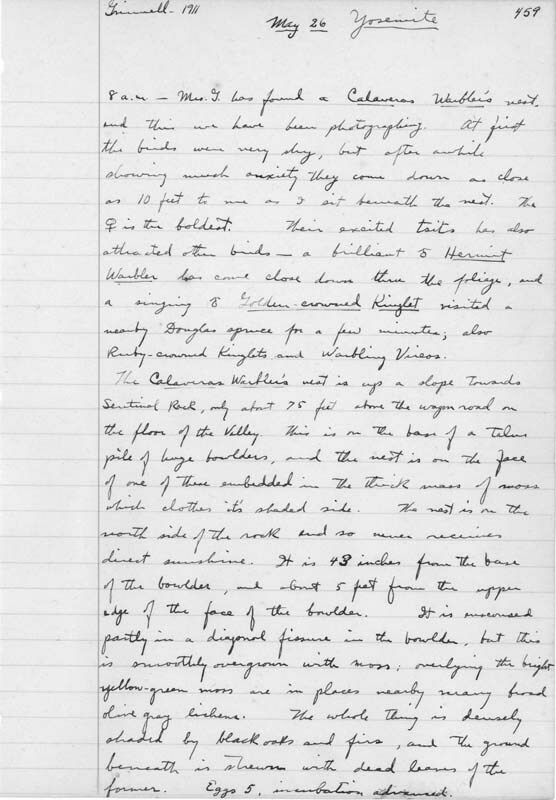 Thus far, ~45,000 pages of field notes (of an estimated 100,000 pages) have been scanned and are available online. Notes are searchable by author, year, and section title, but future developments and ongoing data capture will enable broader search capabilities. One such development is GReF, a web application that was developed to capture data from scanned notebook pages and to link those data to the MVZ specimen database. The museum's collection of ~13,000 historic prints have been scanned for archiving and access. Each print contains two scanned versions: a lower resolution tiff (300 ppi) that shows the image mounted on a data card; and a higher resolution tiff (1200 ppi) of the image without the card. Photographs have been processed into three additional files for online viewing: lower resolution jpeg, thumbnail, and tiled jpeg. The images and associated metadata are accessible through both the Museum's specimen database (Arctos) and the campus photo repository (CalPhotos). View a list of the first 4000 catalogued photographs, which highlights the Museum's earliest photos (1907-1923). They can be browsed by image number, year, or general locality. Read more about these collections.